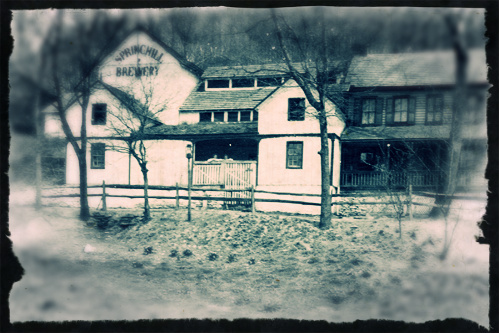 The Spring Hill Brewery in the tiny village of Wooddale was a rare 19th and early 20th century example of a commercial brewery operating outside of the state’s population center, though it did have its origins in Wilmington. The little brewery was operated mostly by the Biedermann family for its duration from 1881 until 1911. F. Hermann “Henry” Biedermann, a native of Altenburg, arrived in Philadelphia in April 1854. After spending time working as a farmhand in Chesapeake City, Maryland and Kennett Square, Pennsylvania, Biedermann settled in Wooddale, taking a job in the Delaware Iron Works factory in 1862. Henry believed that a brewery in Wooddale would be successful due to the thirsty population of itinerant foreigners working at the nearby iron works and quarry. The opportunity presented itself in early 1881, when he leased property along the Red Clay Creek to his son-in-law, Christian Friedrich “Frederick” Wurster. A native of Grafenberg, Germany, Wurster came to America in 1871 and bounced between brewery jobs in Philadelphia and Buffalo. In 1880, he removed to Wilmington and embarked in the brewing business for himself. Wurster ran a lager beer saloon at 14 E. 2nd Street with a small brewery in the back. The venture was a bust and, in early 1881, Wurster moved his brewing operations out to Wooddale. Wurster’s Spring Hill Brewery which opened in May 1881, included summer gardens to entertain visitors from the nearby Delaware Western Railroad. His ownership was short-lived however, and, in September of that year, Wurster sold the brewery outright to Biedermann. He soon left Wooddale for Kent Township, Ohio, where he opened a bottling business. In 1882, Biedermann leased the Spring Hill Brewery to Specht & Spahn, who operated also the Excelsior Lager Beer Brewery at 5th and DuPont streets in Wilmington. The firm conducted a summer garden and saloon at the site during 1882, and made big plans to expand the brewery. However, the latter never came to fruition, and Specht & Spahn left to focus on their Wilmington business. Biedermann then entered the brewery business with a man name Wiedemeier* under the name Biedermann & Wiedemeier. By 1885, Wiedemeier announced his retirement from the firm, so that he could devote himself to his new brewery in nearby Chester, PA. Biedermann’s brewery remained a small operation with an annual capacity of less than 500 barrels. In fact, Biedermann was quite proud that he only serviced in and around Wooddale and did not import his products into Wilmington. Henry’s son, George J. Biedermann, took over the Spring Hill Brewery upon the former’s retirement in 1888. Not only had George received formal and practical brewing training at Specht & Spahn’s brewery in Wilmington, but he also proved to have a very keen business mind. George installed a bottling plant to allow him to expand his market to the home trade. His sudden death in 1905 saw the business change hands once again. George’s brother, Herman F. Biederman (he preferred to leave off the final ‘n’ in his last name), reluctantly assumed control of the family brewery but ran it very capably. An accidental explosion at the Wooddale quarry across Red Clay Creek rocked the Spring Hill Brewery from its foundation and nearly killed Herman and his wife, who lived in an adjoining house. The brewery was a total loss but Biederman decided to rebuild. Unfortunately, another tragedy struck in 1911 when the brewery caught fire and burned to the ground. This time, Herman decided to cut his losses and retired to a farm in Hockessin. A rock foundation and remnants of a well are all that remain of the old Spring Hill Brewery, off of Barley Mill Road, near Hoopes Dam. *It is suspected that “Wiedemeier” (alternately spelled “Weidmeier”, “Weidmair”, “Morris Wedman”, and “Moritz Widman”) may indeed have been Moritz Wiedmaer, a German immigrant who became a naturalized citizen in Wilmington, DE in 1891. Wiedmaer was proprietor of a new brewery in south Chester, PA, which opened in late 1885. He ran the Gloucester City Brewery, Hotel & Park near Camden, NJ (1888) and, a few years later, became a co-owner of the short-lived Waldschloss Brewery in New Brunswick, NJ. Waldschloss, a brewing company started by Camden associates, had plans to become a regional brewery but went bankrupt in 1897, after only a few months in operation. No trace of Wiedmaer has been found after sale of Waldschloss in early 1898.